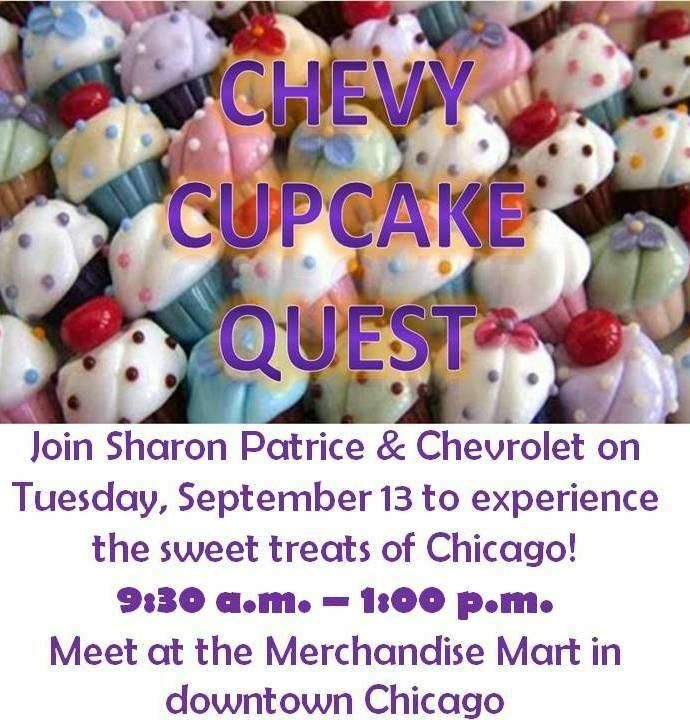 ChiIL Mama had a blast this week, being part of a sweet scavenger hunt, Chevy Cupcake Quest. Patron quote of the day, overheard at Sugar Bliss, "3 of these mini cupcakes are the perfect antidote to a half marathon!" Though Team Sweet didn't win, we came in a respectable second, and had a ton of fun. 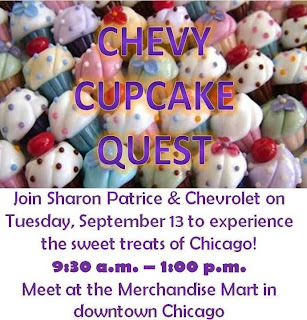 A fleet of bloggers headed out in 3 red, white and blue Chevys, on a 2 hour bakery hop, with the directive to taste cupcakes and send out sweet tweets. I was in the white Suburban with blogger, Michelle, @HonestandTruly and Connie Burke from Chevy. My only regret is the catch 22 of social media....it makes us less social in person when we're working an event. I would have loved to talk more with Michelle and Connie, but it was a race after all, and we got extra points for every tweet. My fingers and brain were busy on my smart phone and the ipad Chevy loaned each team for the race, which left little time to socialize. I did hear Michelle's husband was just in NY on Who Wants to be a Millionaire but she couldn't reveal any of the details till it airs (or she'd have to kill us). Connie told us about her son and daughter who are both chefs (and one is dating a chef, too) so holiday meals are pure bliss! So far, at 8 & 10 my kids both still want to be vets....so not so tasty on the holiday food potential. Although maybe on dual vet salaries they can hire a chef for our holiday meals! We're all over the music and theatre scene, but gourmet cooking is not my forte'. On the cupcake quest, we did make it to 3 of the 4 bakeries, reviewing some decadently amazing cupcakes as we went. It was a sugary, sweet, journey of alliteration as our Suburban made "S" stops at Sugar Bliss, Swirls, Sweet Mandy B's and Sprinkles. The Suburban seats 7 and was roomy and comfortable. If my kids would be half as quiet in the captain's chairs in the back as Connie Burke was, I'd buy a Suburban in a second! Despite it's name, the Suburban was easy to navigate around our urban environs with built in On Star navigation. The cup holders were perfect for my take out coffee with a slide over top to set our carry out cup cakes on, when we ran short on time. My favorite feature is the back up warning system that beeps more the closer you get to an object. It's perfect for city parallel parking without playing bumper pool, or hearing that unfortunate crunch as you ease into a too small spot. Congrats again to winning bloggers, @frostedfingers & @aliciamarie112. They both won $100 gift cards to Bleeding Heart Bakery and a week loan of a Chevy! The cupcakes at each bakery were all decadently delicious, but our favorite for funky decore and great food is Bleeding Heart Bakery. We'd been to all their other locations over the years, but this was our first glimpse at their brand new Chicago Ave. digs. Thanks again to blogger, Sharon Patrice, @DesignsbyShay for the invite and setting things in motion and thank you Chevy for the sweet ride and fun times. SO...YOU THOUGHT I WAS QUIET, EH? WELL, I GUESS I HAD YOU SNOWED! It was great fun, wasn't it? But totally agree, I was making myself sick like an idiot from being heads-down on my BlackBerry in the back seat (...not to malign Michelle's driving prowess, or anything). Could have had something to do with the sugar in my system as well. All in all, it was great spending some sweet quality time with my Chicago social media peeps - because they are the best! Thanks very much for you support & enthusiasm, Bonnie. Means a lot.